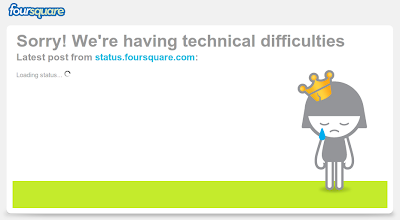 Ryo Central: Foursquare down. Was it hacked? Foursquare down. Was it hacked? I was shocked to see the Foursquare service completely offline this morning. Rumors saying, massive amounts of user accounts has been deleted. And now it's gone. Was Foursquare hacked? It doesn't look good. 3:45pm EST/8:45am GMT: We’re investigating now. [UPDATE] 3:55pm EST/8:55am GMT: We’re still working to restore service. [UPDATE] 4:05pm EST/9:05am GMT: We’re still chugging away, be back soon. That really sounds like a major hardware problem or a hacking attack. Now many user will have some fear about their personal data and location-based information, I'll guess. I hope we will soon get a statement on what, why, and when this incident happened. Nonetheless, I like foursquare and can't wait until they are back to check-in again. Update: Foursquare is back up again. Questions remains.